When: Friday, September 22, 9 AM to 3PM and Saturday, September 23rd, 9 AM-11:30 AM. Where: Grace Reformed Church, 3320 N 2nd St. Rogers, AR 72756. Description: The world is filled with hostility against the Christian faith. This hostility can become a real temptation to young Christians to dismiss their faith as an outdated, irrational thought structure. This class is designed to do several things. 1) Provide a basic overview of the Christian worldview. 2) Show the irrationality and inconsistency of unbelief and non-Christian worldviews. 3) Show the Bible’s own approach to Christian apologetics. 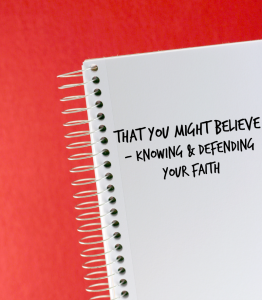 4) Show how to give thoughtful answers to common objections against Christianity. This class is a beginner’s course designed for those in the 10th-12th grade age range. It assumes a basic knowledge of the Bible, and Christian doctrine. Knowledge of philosophy and other religions is helpful but not prerequisite. Price: $35 per student. The price includes the book Every Thought Captive by Richard Pratt, and a folder with class materials. What to Bring: Bring a pen, your Bible, $35 for the class, and your God-given minds to think and learn. Sign Up Deadline: Friday, September 9, 2017. No sign-up requests accepted after this date. Are parents allowed to stay for the course? Yes, parents are more than welcome to attend at no additional cost. If parents, however, wish to have the book and class materials, then they need to pay $15 for them. The book itself is $10. Will there be lunch provided? No, students (and anyone else attending) should bring their own lunches on Friday. Snacks and drinks, however, will be provided. How much knowledge of philosophy or other religions is required? There are no requirements to take the course. This is a beginner’s course, so any previous study or understanding of philosophy or world religions may be helpful, but are not necessary. What will be of greater help is if the student has some critical thinking skills and some knowledge of the Bible and Christian teaching. Will this class be taught from a specific denominational perspective? This class assumes that there will be a variety of denominational or even non-denominational backgrounds, so it is set up to teach a general view of the Christian faith and how to defend it. However, I will be teaching according to a general evangelical view of Christian orthodoxy (right teaching), so unbiblical views of the Trinity, Christ, the Bible, Christian ethics, etc. will be taught here as outside the historic Christian faith. Can students younger than those specified take the class? Yes, younger students can take the class, but this class is designed for those in the 10th-12th grade age range and may or may not be too difficult for younger students, depending on their personal educational level. Will other classes on Christian worldview and apologetics be made available? It is my hope that if this class receives a favorable response, that more classes will be made available.